Kyle Hildebrant is a partner at the branding agency OVO by day, and in his off time, publishes the culinary blog Our Daily Brine. Billed as a “personal journal of food exploration and experimentation”, it is focused on topics like fermentation, preservation, charcuterie and salami. We highly recommend checking it out. Can you tell us a bit about where you grew up and how you got interested in food? Was there a moment when it really clicked for you, in regard to the kind of culinary projects you’re interested in? I was born in Roseburg, a small town in Southern Oregon. We actually lived outside the city limits of an even smaller town called Dillard—which last I checked, had a population about 500 souls. We lived atop a hill with a long, gravel driveway so steep it required a somewhat precise entry angle and sufficient momentum to ensure you didn’t end up sliding down backwards—something few of our relatives would even attempt. If you were city-folk, you might have called our place a farm. There were several sheds and a main barn, three times the size of our modest mobile home. Water was from the well and a good portion of the food came from our garden. We had cats, dogs, chickens, goats, a couple pigs, a cow, a horse, and at one point what seemed like thousands of rabbits. As a way for my father to supplement his lumber mill worker income, we’d raise and sell rabbits to a local abattoir on the weekends. That all lasted until about 1989 when the local economy collapsed. The lumber industry, who’d been plagued by environmental battles and labor disputes found itself in a multi-state union strike that put an entire economy on hold over night. We moved south, to Phoenix, Arizona, in search of work; trading the rural life for suburban bliss [sarcasm]. I lived there some 24 odd years—for the most part hated it—then in 2010 I moved with my now wife, Lisa, to Portland, Oregon. Portland is home. Outside of missing family, we couldn’t be happier here. As for how I came to be interested in culinary pursuits, that’s a question I’ve been asked many times now, and one I really don’t have a great answer for. There wasn’t really any one inciting incident or ah-ha! moment for me. It’s been more of a slow progression; a lot of little moments that have gradually led to an obsession. I’d like to think that as a child I was more open-minded to a wider range of flavors. It seemed like your average kid couldn’t get excited about anything outside of the typical mac and cheese, chicken nugget and pizza repertoire. Whereas I was the weird one eating onions like apples. My childhood is dotted with these very distinct food memories—and maybe more specifically, scent and flavor memories. Warm milk, straight out of the utter; lips coated in fat from a chicken and dumpling soup; Crown Prince brand kipper snacks with saltine crackers; the first time I smelled lamb cooking; spinach stewed with butter; liver and onions; and fresh-from-the-vine tomatoes. The lingering smell of tomato vine on your fingers is just as good as it gets for me. What is your approach when tackling a new project? Seems the word ‘recipe’ falls a little short in discussing what you do. You might describe my approach as obsessive. When I am interested in any particular topic I research it fanatically. I’ve never been content with just knowing the how. I need to know the why. For example, many cooks would be content knowing how to get the perfect sear on a steak. Some may even know several different methods to achieve that same end. And that’s perfectly fine. But for me, I want to know why. Why is that brown crust so delicious? What is happening at a molecular level? Who is this Maillard guy? How did a French physiologist who studied the metabolism of urea in our kidneys lead us to a better understanding of cooking? To address “recipe”: I’m personally interested in the components or building blocks of recipes. So, rather than a complete dish, I like to dig into the ingredients that the dish is composed of. Maybe that is a fermented vegetable broth, or a salami, like ‘nduja. I think most chefs—and I’m not classifying myself as “chef” here—look at recipes as a sum of different parts. They think “Ah, I could use that ingredient in this way…”, or “I could take this fermentation method for miso and apply it to something like chickpeas.”. If you look at a progressive restaurant like Noma, they have a team of folks that work outside of the restaurant, in their lab, working on different methods or fermentation or ways to enhance or manipulate raw ingredients. That’s more where my interest lies. Behind the scenes, building the blocks used to make a dish. Any anecdotes about a trial that went horribly wrong? Gochujang. I’ve failed twice. The second time I set out to attempt it, I found myself scouring the aisles of our local Korean market, searching for something—I think it was fermented soybean powder. I asked a worker if they stocked it, when this little old Korean lady overheard my request and interrupted. She asked why I wanted that. I tell her that I’m going to make gochujang and she laughs. A silly-white-guy sort of laugh. She tells me: “You don’t make gochujang. You buy gochujang.”, pointing to the aisle behind us, which is packed floor-to-ceiling with the stuff. She goes on to say: “Korean people don’t even make gochujang…” as she walks away. I’d like to say I didn’t let that deter me, but I failed a few months in and I haven’t tried again since. The issue here, in Portland, is that it’s not as hot as in Korea. You’re supposed to keep the stuff in the sun during the summer days, and bring it back inside every night. And you have to stir it every day, or it goes moldy. Mine went moldy. One of these days I’ll prove her wrong. Is there something you’ve wanted to tackle for a while, but haven’t. If so, why? Sake. Beer. Wine. Despite all of the fermentation I do, I’ve never ventured into alcoholic beverages. I’m not sure why. Sake is of particular interest, but requires such a commitment of time and long periods of sustained oversight. One day. Cheese is another frontier that I’m really eager to explore in more depth. Really, the list is long. And I do keep a list. Although it is certainly on the upswing, mainstream preserving in America seems to have been forgotten for a while. What do you think is driving its resurgence? That’s a great question. I think people are tired. Humanity has always had this drive to be more, to be better. Faster horses. Cars. Automated machines. Computers. Networked everything. It’s progress. But I think deep down inside of us all we long for simplicity. If you ask people what they want, they will tell you options. Choices. I call it the Mexican Restaurant Menu Syndrome. You’ve seen those menus at mexican restaurants that have a million different dishes, right? But people really do not want to choose. It’s one of the reasons that In-and-Out burger is so successful. It’s why we see restaurants around the world rolling out tasting menus. Or the litany of new, high-end restaurants who only offer prix fixe dining, allowing no choice at all. We’re overwhelmed with choice and starved for authenticity. We have a thousand Facebook friends yet have never said a word to our neighbor. I seems like the resurgence of food preservation is a manifestation of our desire to connect to something more tangible. Food is key to our existence. And I think these type of practices, like canning, feel honest and rewarding. I could go on. No doubt there’s no single reason, but I think that’s at the heart of it. It’s what’s driving all of this “back to our roots” way of living. From your writing and recent travels, Asia must be a topic of interest to you. Is there something you can share that you’ve learned from Asian cultural perspectives? I fell in love with Japanese culture as a young boy. My grandmother’s brother spent a lot of time in Japan and would return to our little town with all of these Japanese treasures. Woodblock prints. Records. Incense burners. Dolls. Pottery and porcelain tableware. I would retreat to my grandmother’s den, light incense, and spend hours staring into this display case crammed with Japanese artifacts. Our tiny town was free of much worldly influence and our TV had maybe a channel or two. So, for me, this was like opening a window to a whole new world. My first serious foray into cooking was Japanese cuisine. I learned to make dashi before I learned to make chicken stock. Japanese Cooking: A Simple Art, by by Shizuo Tsuji, was one of the first cookbooks I purchased. Today, the majority of food I cook is Asian-inspired. Primarily Japanese, with a bit of Korean and Vietnamese influences. I recently returned from a month in Vietnam. 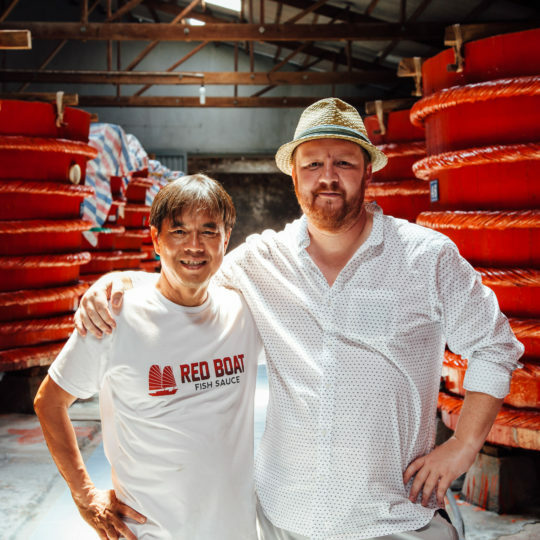 I and a few others were invited by Cuong Pham, the owner of Red Boat fish sauce, to come spend time with them and check out their operation. My wife and I traveled with Michelle Tam and Henry Fong of the beloved Nom Nom Paleo, Vietnamese author and chef, Andrea Nguyen, food stylist, Karen Shinto, chef Chris Cosentino, chef Jenn Louis, and a few others. I fell in love with the Vietnamese people. It was an incredible experience. The Pham family was impossibly welcoming. We traveled with them for a few weeks; starting in Saigon, then to the island of Phu Quoc where the Red Boat facilities were located. We ate an absurd amount of food. Like 4-5 full meals a day. That experience, the people and the food, will no doubt have an immense impact on how I approach cooking moving forward. There’s just so much to learn and nothing is as illuminating as leaving your comfort zone and immersing yourself in a different culture. Any specific ingredients you are particularly excited about right now? Honestly, I’m still a bit obsessed with fish sauce. While it’s just not possible to make something comparable to the quality of Red Boat, or some of the other Vietnamese makers, I’ve been enjoying the process. I even just recently commissioned a hand-made wood barrel to be made specifically for fermenting fish sauce. I’ve been experimenting with making different vinegars, miso, tofu, and of course I am always making various type of salami. ‘Nduja, a spreadable salami that originates in Calabria, Italy, has been of particular interest lately. Favorite purveyors you can share with us, both near and far? 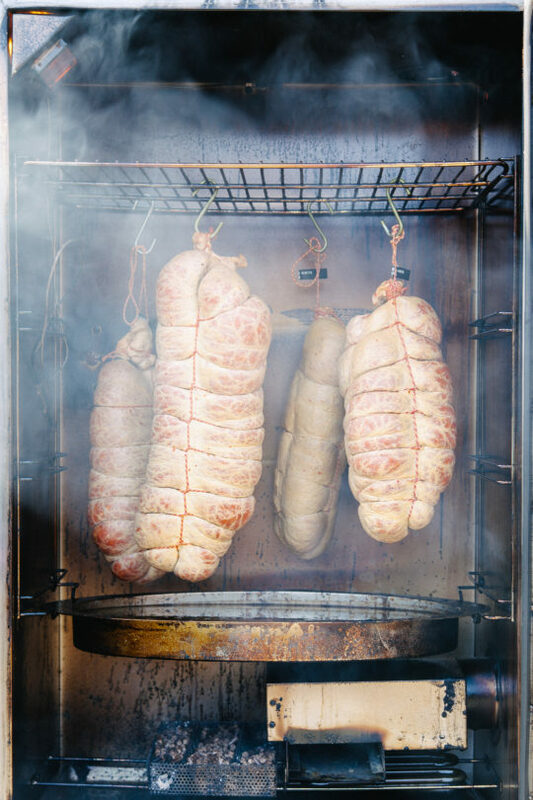 My good friend and occasional partner in crime, Evan Brady, runs Craft Butchers’ Pantry—in the off time he’s not working alongside Agostino and Antonio Fiasche, who own ‘Nduja Artisans. Craft Butchers’ Pantry are sourcing some amazing stuff from Italy that you cannot get anywhere else. 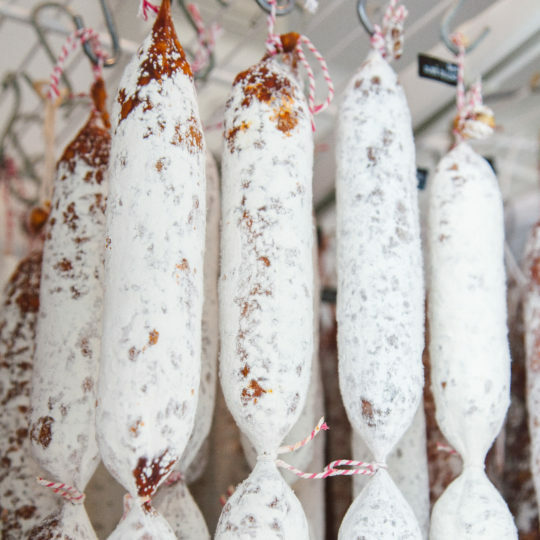 Various hard-to-find casing for salami, Calabrian peppers for ‘nduja, and a whole bunch of other stuff that is exciting for those of us making salami. ‘Nduja Artisans is also making the best ‘nduja available outside of Calabria, Italy. Not to mention all of the other excellent salumi. 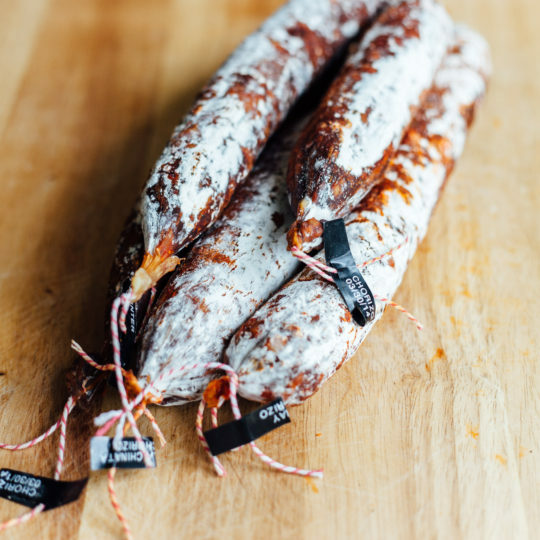 I’m also starting a collaboration with Creminelli Fine Meats, who are making some of the best artisan salami available in the States. If you’re ready to have your mind blown, order some of the Tartufo (black summer truffle) salami from these guys. It’s something special. And there’s also Hanna Instruments. They are providing a wide range of scientific instruments to the food industry. 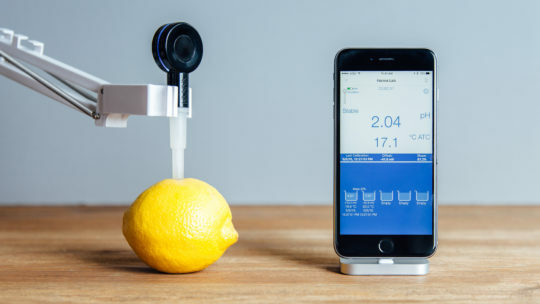 We collaborated about a year back and they made me the first prototype of a pH meter that was designed to measure pH of salami–and other foods—during fermentation. Since then that meter has gone into production and a lot of people in the industry are using it. It’s exciting to see that collaboration result in this new tool, the Halo FC2022 pH Meter, that didn’t before exist, be available now. On that topic, I’ve recently published a small book that is a guide to testing pH in food and drink. Kitchen tools you’d have a hard time living without? A knife, right? Although that smacks of the expected answer, it is the truth. I’d have to say my knife roll, a Nomiku immersion circulator and a scale. The circulator I can probably live without, but it’s so handy, especially when cooking in an unfamiliar kitchen. I also may need to add my phone to that list. I keep all of my completed recipes in Paprika Recipe manager. And all of my notes on in-progress recipes, experiments, menu plans, prep lists, etc., are in Evernote. Also, if you have never used it, Siri can be super helpful for quick conversions, like: “Siri, how many grams in a cup of water?”. And on that subject, can we please all agree to stop using volume and Imperial measurements in the kitchen? Any restaurants or chefs that you are especially inspired by? That’s another really tough question. I have a huge amount of respect for Jamie Oliver. I started to get more serious about cooking in the early ‘00s when he was just starting his first show, The Naked Chef. Here was this young guy, passionate about food, cooking for parties and friends. I identified a lot with that. Now there are a million and a half “Celebrity Chefs”, at that time there were just a couple TV shows about cooking and he was certainly the youngest. Moreover, he seems to be a man of integrity. He’s doing some great things with his money. I feel like he’s used his platform to make a very positive impact on the world. And for that, I have a great deal of respect. As for his food, and his cooking, there’s not a lot there I find personally inspiring. 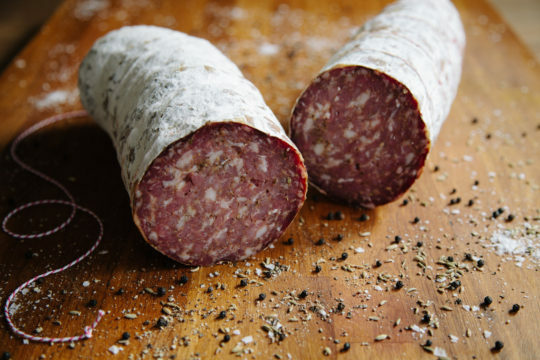 Italian cooking—outside of salami—is not something that resonates with me. Nobu was one of the first chefs I found inspiring, from a culinary perspective. Later on, Morimoto. Jacques Pépin, Julia Child and Ming Tsai were inspirations, primarily because they all had shows on PBS, and my access to any sort of “paid” television was limited. Discovering Harold McGee’s On Food and Cooking was another big milestone in my combined interest in food and science. I’m always astounded by his ability to simplify an immensely complex topic and make it digestible for all. I believe it was Einstein that said: “If you can’t explain it simply, you don’t understand it well enough.” McGee is a man of prodigious talent. One last one: James Peterson. Not a celebrity chef and probably a guy that is way too often overlooked. Sauces, a ‘91 James Beard Cookbook of the Year winner, is insanely comprehensive. And Cooking, another James Beard award winner, is one of the most fundamentally influential books I have read to date. When people tell me they want to get into cooking, and ask for book suggestions, that’s where I point them. Everything—outside of practice—that you need for a solid basis in French technique is in that book. And it’s immensely accessible. Photography Courtesy of Kyle Hildebrant and Jeff Newton.